When we first meet Mary Ann Singleton in Tales of the City, she's just moved to San Francisco from Ohio. She is naive and a bit of a ninny. There are eight TofC books, and although Mary Ann seems to be beloved by the author, truthfully, she's rather annoying. In book or two before Mary Ann in Autumn she's even worse--a self-centered, self-involved climber who abandons her friends and child. Still, Maupin gives her a chance at redemption. 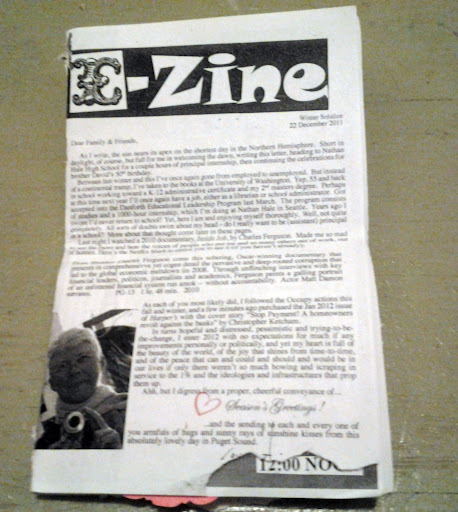 Somehow Elaine's annual zine got buried in my ever-expanding to-read pile, and I only just rediscovered it. Elaine is a school librarian now in school to become a school administrator--probably a vice principal. She discusses her personal politics that might make it hard for her to get a job as the head of a school, namely that she finds certain state statutes (regarding political indoctrination, e.g., de-facto mandatory pledging of allegiance to the flag) problematic to enforce. That passage reminded me of Ms. Finney from The Cat Ate My Gymsuit. Remember her?